Thanks to the Cosmic Putting Golf Game office life is about to get a lot more exciting! Mini golf is one of the all-time great pastimes. You get to play with friends or family, show off your amazing bank shots and loop-de-loop skills, and then talk a little game when you beat the pants off of your mom. That's because you don't have to be a professional golfer to be in love with mini golf and it's absolutely fine if you're terrible. The Cosmic Putting Mini Golf Game was designed to let people in their offices get out from behind their desks and show off their best putting skills just like a summer's day spent out that golf/go-kart place we used to hang out in as kids. The best part? Our 36-piece track single hole kit can be designed in unlimited ways so you can make your own obstacles and your own golf rules. Not only that, but you can flip on a black light and play in the dark because our tracks are neon! Have a little fun with your coworkers, or just show your kids how awesome you are at putting together a golf course. Pick up the Cosmic Putting Mini Golf Game and relive your highlight reel shots once more. Do you have what it takes to create the one unforgettable hole your entire work keeps talking about? Click "Add to Cart" and find out now. UNLIMITED HOLE DESIGNS: We created our indoor SINGLE HOLE kit to allow players to build the track they imagine. Using grooved tracks, half-moon rails, and a little imagination, you'll never run out of hole designs. FUN, VERSATILE USE: The Cosmic Putting Golf Game was designed so it can be used both indoors and outdoors, which is why our tracks come in so many vibrant colors. BECOME THE OFFICE TOUR LEADER: Use multiple kits to create the most epic office golf event the world (or your office) has ever seen with the flexibility to buy kits for as many or as few holes as you want to play. Can you get that much-needed birdie on that final par 4 to seal your green jacket win? MAKES A GREAT GIFT: You don't have to be a golf pro to love our amazing mini golf game. Give this as a gift to anyone with a little competitive spirit and see how the fun ensues! 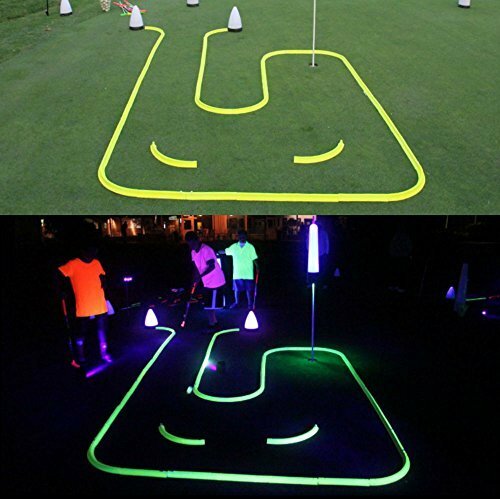 NEON GLOW GOLF: Our tracks are made with neon colors that glow under black lights (sold separately) so you can enjoy glow-in-the-dark golf. This means you can transition from a day game to a night game and still pack in the fun no matter what time you're at work. If you have any questions about this product by GlowGear, contact us by completing and submitting the form below. If you are looking for a specif part number, please include it with your message.